Ever found your cat feasting on your dog’s bowl? In most cases, it won’t do much harm if your cat grabs few pieces of dog food. However, if this happens on a daily basis, some boundaries have to be made. If you own two pets that live together, it’s very important to distinguish their feeding bowls. It’s a very bad idea to feed multiple pets – cats and dogs with a single food bowl. Each of your beloved companions has to have its own bed, water bowl, and food bowl. But what to do if you cat keeps returning to dishes that are meant for your dog? This is why we have created this article to help you learn and fix this seemingly harmless issue. Often dogs are just too lazy give your cat a bark or show some other signs that this is their bowl and their food. Why? Because most of the time owners fill up dog’s bowl as soon as it’s empty. There is no feeding regime for your dog. This means if the bowl is always full and always have been full there is no need to protect it because as soon as it is empty, it will be refilled. I bet you have noticed that your dog’s attitude changes when it gets a treat, for example, bone. This is because he gets this kind of food only on rare occasions, meaning it’s more valuable. What if your vet has pre scripted your dog a special kind of dog food? If your cat eats “special” dog food that’s supposed for allergies, skin conditions and post surgeries, he might get sick. Obesity may also become a factor, as your cat has access to more food than it should. While most cats tend to live indoors, they lack exercise which results in obesity. Unlike with dogs, controlling cat’s exercises and the time he spends moving is hard. Therefore the only solution is limiting food intake. The difference in dog and cat food nutrition is another thing to keep in mind. There is a “Dog” and “Cat” food for a reason, if there wouldn’t, we would have a universal food that’s great for all animals. Dogs and cats require different protein, fat and carbohydrate ratios as well as vitamins and minerals. It’s nothing bad if your cat grabs a chunk or two from dog food. However, if this is frequent and in large amounts, your cat might get an unbalanced diet that can lead to unwanted health conditions. How to stop a cat from eating food that’s supposed for your dog? Now when we know why it’s so important for your cat and dog to eat from their own bowls, let’s solve this problem! Fortunately, this can be done quite easily. First, you have to understand that dogs will eat cat food and cats will eat dog food. There isn’t a significant difference in taste that may seem unpalatable for your cat. So you can’t solve this by switching to a different dog food. What you can do is limiting your cat’s access to dog’s bowl. You simply can’t take and eat something that is not there. The best solution is putting your dog on scheduled meals. 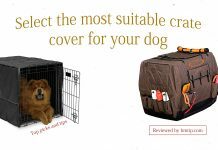 Now your dog won’t be able to eat when ever they want to and they will care more about the food. Don’t worry about your dog being more aggressive or change in its temper as long as you sustain it with enough food everything should be just great. The best choice is providing your barking companion with two meals at the day. Portions size is important so your dog could eat everything at one meal in the same time not feeling hungry. Cat deterrents and any known smart technologies like cat doors with integrated chip won’t solve this issue so you will have to go with scheduled meals. But to make it more effective, you can adhibit some side activities. Dog’s lifestyle can affect this issue by quite a lot. For example, if you are free feeding your dog and he lacks exercise, it won’t require as much food and will be lazier. You can start going on long walks and exercise with your pet on daily basis. In the result, your dog will require more food and will care a lot more about its bowl with dog food. To keep your dog fit you can try getting it an interactive dog toy so your dog can play with it even if you’re not near by. Another thing you can do to achieve greater results is feeding your cat and dog in separate areas or rooms – isolate them when they are eating. 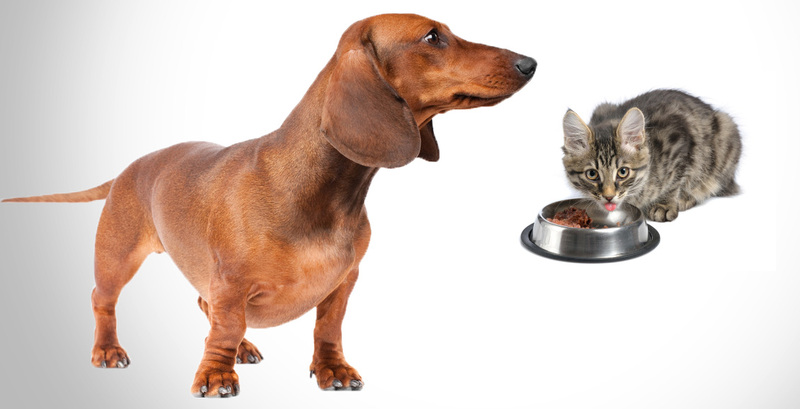 In a combination with scheduled meals, your cat won’t get any chance to feast with kibbles of your dog’s food. The first on possibly the most important thing you will have to do is find out how much food your dog needs a day. You can ask your vet for this information or find it on the back of dog food packaging. HM tip: Don’t only rely on the theoretical amount of dog food your companion needs to consume a day. Try it for a day or few to see if it’s enough for your dog. Maybe it’s not and you will have to add a bit more or maybe it’s too much. Watch your pet for few days while on the scheduled meals and adjust the portions. Next step is to split daily food intake into at least two parts. This depends on you. You can feed your dog twice a day – once in the morning and then in the afternoon or you can split and schedule meals how you like, just remember not to change the daily amount of food your dog receives. It won’t do any harm if you don’t feed it at specific times, you don’t have to be precise. Just feed once in the morning and when you come back from work. At first, when you will pour some dog food in its bowl, your pet might not show any emotions as it is used for food always being around, but with time your companion will adopt and eat it’s portion as soon as you refill it. As soon as your dog will eat its first meal, wait for around a half an hour and then take the bowl away or empty it. When the next meal time comes, serve his portion (remember not to compensate what’s left over the previous meal) and repeat the process. With the time your dog will adapt to scheduled meals and there won’t be any leftovers for your cat to feast on. Dog owners have a full control over their dog’s diet, health, and lifestyle. One of the easiest ways to maintain your Dog’s optimal weight is scheduled meals – you don’t overfeed your pet yet provide it with enough nutrition. It also can help when it comes to training as dogs will be more motivated to get a treat if they can’t access food when ever they want to. If you don’t have any additional dog food lying around, it’s less likely other animals like mice and rats will steal your dog’s food. There won’t be any delicious food that’s easily accessible to other animals (especially rodents). 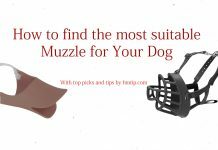 Dear reader, we sincerely hope that this article has helped you solve this issue and you have made changes in your dog’s lifestyle from which all of you will benefit: your dog, your cat and yourself. Scheduled meals are the only way to go as it will completely stop your cat from eating dog food. You can read more about scheduled dog feeding in our “Dog Feeding Schedule – Should I do it and if so, how?” article. Next articleDog Feeding Schedule – Should I do it and if so, how?